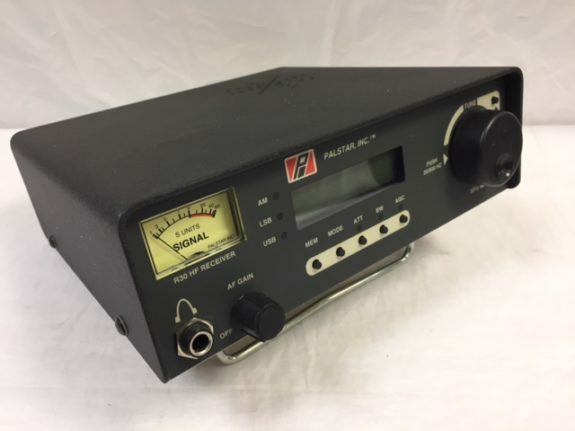 The Palstar R30 is an innovative shortwave communications receiver made right here in Ohio, USA. Coverage is from 100 kHz to 30 MHz in AM, LSB, USB and CW modes. The six digit backlit LCD display shows frequency to the 100 Hz. The tuning rate is 20 to 100 Hz or 100 to 500 Hz step in fast. Both rates per step are speed variable. The 100 memories may be selected with the front panel tuning knob or Up/Down MHz buttons. The two bandwidths may be selected independent of mode. Other features include: Analog S-Meter, 10 dB RF Attenuator, AGC Fast/Slow, snap-down metal tilt bar, tuning lock, internal speaker, mute line, backlight on-off, RCA line output, 1/4 inch RCA speaker output and 1/4 inch headphone jack. The rear panel has a 50 ohm SO-239 antenna input jack plus provisions for a Hi Z long wire antenna. Perhaps the very best feature of this radio is its clear, quiet sound. This radio comes with an AC wall adapter or may be operated from 12 VDC (@300-600 mA). There is also a cell holder within the radio that holds ten AA alkaline cells for portable operation. (AA cells are not supplied and cannot be charged inside the radio). Only 8.25 x 2.5 x 8.8 inches. This product features a one year warranty.